Sheffield United boss Nigel Clough said his side's League Cup win over West Ham brought back memories of their run to the FA Cup semi-final. The League One club beat the Premier League outfit 5-4 on penalties after the game ended 1-1 after extra time. 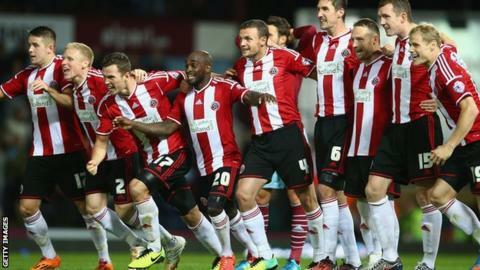 The Blades saw off Aston Villa, Fulham, Nottingham Forest and Charlton on their way to last season's FA Cup semi-final. "It was reminiscent of the run last season with our backs to the wall," he told BBC Radio Sheffield. "Obviously it brought it all back for the lads that were here last season and we said to the new boys that this is what it felt like. "It was lovely to see the supporters like that at the end. They made so much noise, you wouldn't have thought they were outnumbered by 28,000." He added: "We were reasonably pleased with the first half but we knew we needed to go out and get a goal and put them under a bit more pressure. "I thought we deserved the win over the course of the two hours." The Blades, one of the favourites for promotion from the third tier, have won two and lost two in the league so far this season. Clough believes they still need to make a couple of additions to the squad and has confirmed they will be making a move to take Hull City centre-back Harry Maguire on loan. The 21-year-old joined the Tigers from the Bramall Lane side last month and made his debut in last week's Europa League defeat by Lokeren. "Harry knows where we are and we will certainly be making an enquiry," he said. "It's just a matter of if he feels like it is a bit of a backwards step after signing for a Premier League side but we will ask the question. "We're still not close to where we want to be. We need a couple more players in and for the new players to get to know their roles better."